A pretty slow and uneventful movie that might feature strong acting, but not enought to hold our interest. 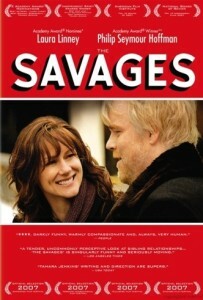 The Savages is a movie about a brother and sister trying to find a nursing home for their elderly father. that sounds like a decent enough premise so long as it leads to something else. in this movie, it doesn’t. there are no real side plots or other stories going on here. the only one that comes close has wendy (laura linney), sleeping with a married man, which would be fine if something interesting came of it. but this movie doesn’t choose to go in that direction. it doesn’t want to deviate from being realistic in any way and as a result, we get a very dull and lifeless movie. the actors here are great, and it is enjoyable to watch them no matter what the film, but this movie certainly puts that to the test, giving them very little to play with. the movie is occasionally funny, but most of the time it’s just pretty dull and uneventful. The problem with The Savages is that nothing really happens. nothing worthy of a movie anyway. movies are meant to give us a view of the world outside of reality. sure, we like realistic films, where the things that take place can really happen, but these things should still be somewhat exciting or funny, and certainly larger than the everyday experience. if it’s a drama, then something like the movie crash works, where you are compelled by the different threatening situations. if it’s a comedy, then something like Knocked Up will do the trick, as it is grounded in a realistic situation, but still gives us characters that are fun to spend time with because of the ridiculous conversations they have with each other. The Savages doesn’t have any of this. it doesn’t have much excitement and it doesn’t have much comedy. i suppose it is a black comedy, more than anything else, but the movie really isn’t all that funny. it’s about a brother and sister who have to take care of their elderly father. they start out, at the beginning of the film, finding out that their father has dementia. they spend the rest of the movie trying to figure out what to do with him. part of the problem might be that the movie gets off to a lousy start. the father of Wendy (Laura Linney) and Jon Savage (Phillip Seymour Hoffman) is living in a house with his elderly girlfriend and the male nurse who is taking care of her. in those opening moments, we deal with the old man not flushing the toilet, and then taking what is in it and painting on the wall. it’s disgusting and unnecessary. if they’re trying to show that the old man is crazy, there are a thousand ways to do it. have him urinate on a wall, or stick his hand through a glass mirror or something. but the thing is, the movie didn’t need to show that he was crazy at the start of the film at all. the story here doesn’t really get started until the father’s girlfriend passes away, so why not skip the whole plot about the old man being crazy, to begin with, and go right for the story of the girlfriend passing and wendy and john having to go down to florida to get their father. once they get down there, wendy and john are told by the adult children of the father’s dead girlfriend, that their father and her had a written agreement which stated he would not be entitled to any of her property. therefore, he is no longer allowed to stay in the house. so now wendy and john have to find a place for him. they go to visit different nursing homes, looking for the right place for their father. the good news is that all of this is incredibly realistic. the bad news is that none of it is very interesting. wendy is having an affair with a married man, and that would be great, if it actually went anywhere. if the man was somehow caught by his wife, or some other climactic and exciting situation. maybe he could be with wendy at a store or restaurant and his wife walks in, and even if he doesn’t get caught, it’s still such a close call that it gives us a little excitement. nothing like that happens here. since the father story doesn’t really have any meat to it, we hope that there’s maybe something outside of that story that we can grab a hold of. there’s wendy’s life and there’s john’s life, and if the movie took the time to explore either one of them we might actually have something. what would you can count on me, (laura linney’s breakthrough movie) have been without the matthew broderkick subplot? And that was a movie where the main story, between she and her brother, mark ruffalo, was actually working. now imagine if it wasn’t. that’s pretty much what we get with The Savages. with john, we learn only the tiniest of bits about his relationship with a polish girl. he was with her for a while, and now the girl is going back to poland. there is one scene where it comes up briefly in conversation between he and wendy, and john tells her that it was either that or get married, and he wasn’t ready to get married. then there’s another scene where wendy wakes up to the sound of john crying in the bathroom. all of this is interesting, and definitely has potential, but the movie never does anything with it. i suppose the point of this movie is to be realistic at all costs. i have no problems with that, however interesting things happen in real life sometimes. wendy can start dating other people, for example. so can her brother, for that matter. maybe it’s a simple matter of the movie never wanting to stray from it’s plot about the kids taking care of their father. some of the most interesting scenes are when they actually get him talking, like when they take him to a diner and ask him questions about what he wants to happen to him after he passes on. his reactions are pretty funny. there are definitely some jokes every now and again, like one moment where john screams at wendy about how terrible nursing homes are and how all of the landscaping and decorations outside are not for the people who live there, but for the visitors. it gives them a little comfort so that they don’t feel like they are surrounded by death. john shouts about how terrible and disgusting death is just as an old woman is being wheeled by in her wheelchair, overhearing the whole thing. unfortunately, there aren’t enough moments like that in this movie. there are not many laughs are highlights, and overall it is just a tired, slow moving, and even depressing film.